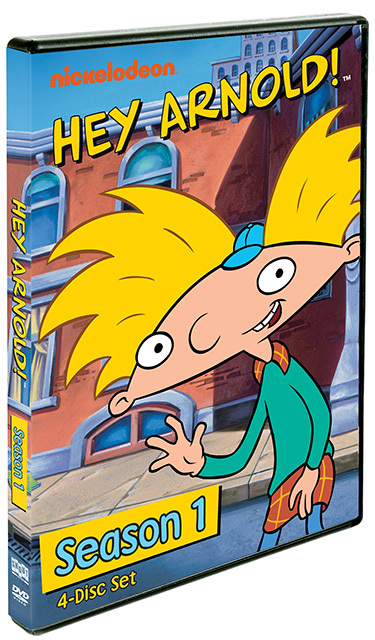 About the DVDHey Arnold !, one of the most beloved animated Nickelodeon series from the 1990s, arrives in stores nationwide for the first time on August 9, 2011, from Shout! Factory. Featuring all 20 hilarious episodes, Hey Arnold! : Season One follows the adventures of Arnold, the original football-headed boy’s life in the big city alongside his Grandpa, Grandma, Abner the pig and a host of other friends and neighbors. Long anticipated by fans, Hey Arnold! : Season One has not been available in stores until now. The four-disc DVD set has a suggested retail price of $29.93. Like all of Nickelodeon’s classic shows, Hey Arnold! : Season One boasts an all-star voice cast which includes Toran Caudell (7th Heaven ), Dan Castellaneta (The Simpsons , Futurama ), Tress MacNeille (The Simpsons , Futurama ), Jamil Walker Smith (Shark Tale ) and Francesca Smith. A favorite with viewers and critics alike, Hey Arnold ! stars Arnold, a fourth grader who lives with his grandparents Phil and Gertrude, owners of the Sunset Arms boarding house. Each episode finds Arnold in a new, sticky situation, whether it’s helping out a schoolmate with their problems or dealing with his own. Unfortunately, Arnold’s predicaments are often started by Helga, a schoolmate who picks on Arnold and constantly bullies him. However, Helga only pretends to dislike Arnold to hide the fact that she is secretly in love with him! Created by Craig Bartlett as a comic in 1986, Hey Arnold ! debuted as an animated short for the Nickelodeon film Harriet the Spy in 1996. HeyArnold! went on to air on Nickelodeon from 1996 to 2001. The show also aired on "Nick on CBS" from 2002 until 2004. My Take on the DVDIf you are a Hey Arnold fan, this DVD was great as it contained all 20 of the Season 1 Episodes. The video and sound quality were great and the DVD truly captures the artistry of the original series. This was another release from The Shout Factory and I have had the chance to view some of their other releases as well and they are all very well done and they are doing amazing work in bringing back some great television series shows from the past to share with current day audiences. I will say that this series does not share extras as some DVD's do these days, but to make it clear, that is ok with me, as there is so much on this DVD, that you will stay busy and engaged for a long time to come! This DVD will let you either relive some of the great episodes from the past or introduce to you this great series. You will not be disappointed!